RCI 7808A - Universal Transmission Blanket 47" x 11-1/2"
JEGS Universal Transmission Blanket is ideal for high horsepower race cars with stock firewall and floor pan combinations where a transmission shield isn't practical. Fastens to any automatic or manual transmission and bellhousing. Each blanket is made from 10 layers of ballistic material and 100% manufactured in the USA. SFI 4.1 certified and NHRA/IHRA Accepted. 60970 is rated 4.8 out of 5 by 5. 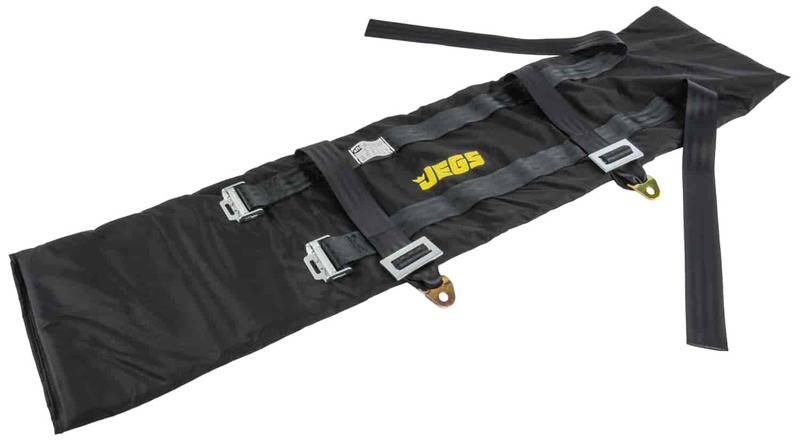 Rated 5 out of 5 by Jegs trans blanket from Transmission blanket Good fit for my mopar 904 auto trans. While planning on fitting a rigid shield in the future this universal ballistic blanket is a great way to go with a tight fit between headers and frame. Rated 5 out of 5 by superralph from easy to install, i just wanted to be safe on the track and for the fans,thanks ralphs931. Rated 5 out of 5 by Mike 440 Mopar from Great Quality & Fit Easy install...we dropped the Torque flute trans crossmember to give us room for the wrap. The straps could have been about 6" longer but it was ok. The trans blanket is fire resistant, but can melt if it gets too close the the header. You will want to put a shield between the header and the blanket. Will this trans blanket catch any leaks that may come from the torque converter seal. I've go a TCI 727 small block transmission. At times I get some drips from the torque converter seal and I drag race the car so I don't want any drips on the track. Yes and it should fit just fine as it fastens to any automatic or manual transmission and bellhousing to protect from a leak mishap. Will this take the place of a scatter shield on a manual transmission. I believe scatter shields have to be 1/4&quot; 360* mild steel. This is made to contain the transmission in the case of a failure. Your sanctioning body will need to give you the approval of using it. This weighs approximately 5 lbs. Yes, this will work on a c4 transmission.